Commander Tim Kopra (bottom row center) will hand over command of the International Space Station to Flight Engineer Jeff Williams (top row center). 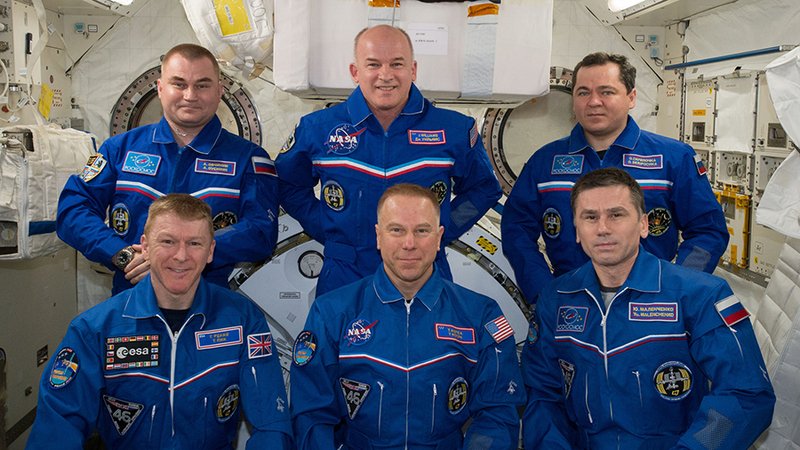 Three Expedition 47 crew members are preparing to go home early Saturday morning. Three other station residents will stay behind beginning Expedition 48 on the International Space Station. Veteran cosmonaut Yuri Malenchenko will command the Soyuz TMA-19M spacecraft that will take him and astronauts Tim Kopra and Tim Peake back to Earth. The trio are due to land Saturday at 5:14 a.m. EDT in Kazakhstan completing 186 days in space. NASA TV will cover the undocking and landing activities beginning Friday at 10:15 p.m.
Before Expedition 47 says goodbye, Commander Tim Kopra will hand over the station command to Flight Engineer Jeff Williams. The traditional Change of Command ceremony will take place Friday at 9:15 a.m. and be televised live on NASA TV. Expedition 48 will officially begin the moment the Soyuz spacecraft carrying the Expedition 47 crew undocks from the Rassvet module. Williams and cosmonauts Oleg Skripochka and Alexey Ovchinin will continue station operations awaiting a new trio of crew members due to launch July 7 and arrive two days later.